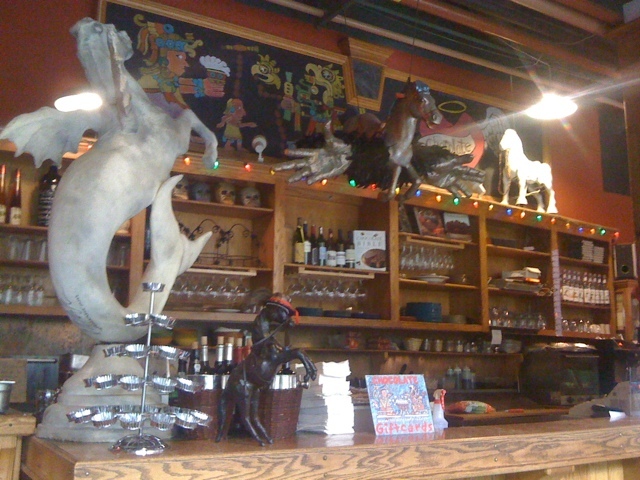 At Chocolate, my favorite Santa Cruz restaurant, with my good friend Robin Mills – find her at www.weavingsongs.com! Teaching is one of my greatest passions and responsibilities, and I’m excited to be able to share my experience with you anywhere in the world via Skype. Skype is a great way to learn from your home, on your harp, with no travel and minimal time restrictions. Let’s talk further! Back in the day, I had to go all the way to Australia (literally!) to work with my harp guru Alice Giles – now learning is so much faster, efficient, and wildly inexpensive. Looking forward to hearing about your harp dreams! Join Diana Rowan (harp) & Daniel Berkman (kora) this Tuesday 7-9pm for a mesmerizing evening of harps across continents! Stop by any time at Julie’s Coffee & Tea Garden in Alameda http://ping.fm/fm8Eq (suggested donation $5) for beautiful music in a beautiful space.